Heat oven to 350°F (325°F for dark or nonstick pan). Generously spray bottom only of 8- or 9-inch square pan with cooking spray (without flour). In large bowl, beat cake mix, buttermilk, food color, baking soda, butter and eggs with electric mixer on low speed 30 seconds, then on medium speed 2 minutes, scraping bowl occasionally. Pour batter into pan. Bake 40 to 45 minutes or until toothpick inserted in center comes out clean. Cool on cooling rack 10 minutes. Run knife around edge of pan to loosen cake; remove from pan to cooling rack. Cool completely. Place cake on serving plate. Frost top and sides of cake with cream cheese frosting; sprinkle with cocoa. Cut into 4 rows by 3 rows. For Red Velvet Cupcakes, place a paper baking cup in each of 12 regular-size muffin cups. Make batter as directed and divide evenly among muffin cups. Bake 18 to 23 minutes or until toothpick inserted in center comes out clean. Cool 5 minutes; remove from pan to cooling rack. Frost cooled cupcakes. 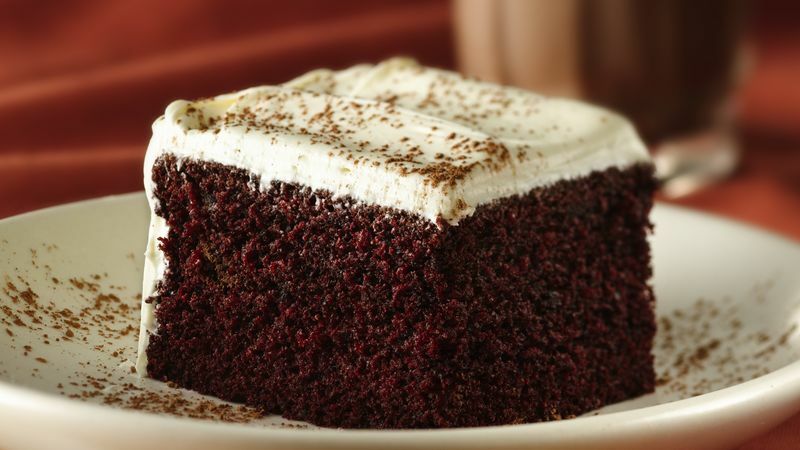 Other white frostings, such as Betty Crocker® Rich & Creamy vanilla frosting (from 1-lb container), can be substituted for the cream cheese frosting.